A man who attacked two "innocent bystanders" in a Birmingham pub has been jailed for seven-and-a-half years. Kyle Pryce, 27, was part of a group which ran into the Sportsman's Rest in Kingstanding, armed with a knife, an axe and baseball bat. The men inflicted "potentially fatal" injuries on two victims during the attack in July, 2013. 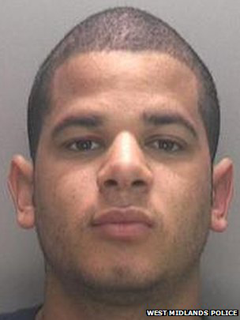 Pryce had denied two counts of wounding with intent but was found guilty by a jury at Birmingham Crown Court. He was jailed on Monday after the unanimous verdict was returned. West Midlands Police said Pryce, of Kingsland Road, Kingstanding, had intended to attack a love rival but turned on pub customers when his intended target hid in a toilet. A 25-year-old man was stabbed in the stomach while a 27-year-old was hit "full swing" in the head with a baseball bat after three armed men entered the bar at about 19:00 GMT. Pryce and his accomplices fled the scene in a silver car but a witness noted down the registration number and passed it to police. Officers spotted the vehicle an hour later and attempted to arrest Pryce but he drove away. He was arrested four hours later after officers tracked the car to Sheffield. They found blood on Pryce's clothes and weapons in the boot of the car. Det Con Lance Pritchard said Pryce was a "dangerous" career criminal. "Both of these two assaults, one with a knife and the other a baseball bat, had the potential to be fatal - but thankfully both men made full recoveries in hospital," he added.